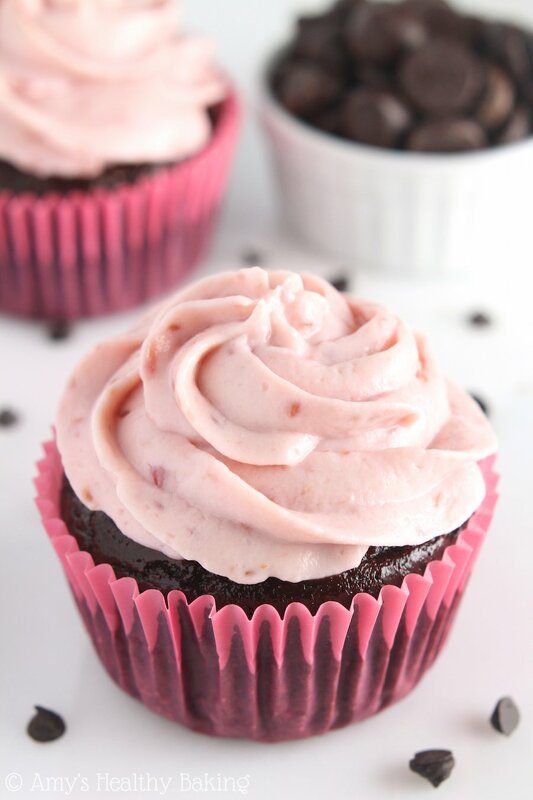 Decadent dark chocolate cupcakes with a light raspberry frosting made from a secret protein-packed ingredient. They’re perfect for Valentine’s Day & any chocoholic! Before I get to the story and recipe today, I have a favor to ask! I’m planning a new project for Amy’s Healthy Baking, and I need your help. Would you mind filling out this quick 2-minute survey? Thank you so much! And now back to the regular blog post! On our second Valentine’s Day together, my guy and I actually celebrated the night before. We lived in a college town at the time, which meant that at least 75% of the students planned to head downtown for a date, so making a reservation was next to impossible, let alone finding a table without one. So on February 13, we got a little dressed up and drove over to one of the nicer sushi places. He ordered teriyaki chicken, I chose a smattering of sushi rolls, and we split everything between us. With me being an indecisive person, that was a really sweet gesture from him! At the Whole Foods bakery next door! One of my high school friends actually worked in the bakery at a different Whole Foods in another town, and she gave me lots of tips on which desserts were the best. So for my sweet treat for Valentine’s Day, I chose the vegan chocolate cupcake because it had some of the fudgiest chocolate frosting I’ve ever eaten. 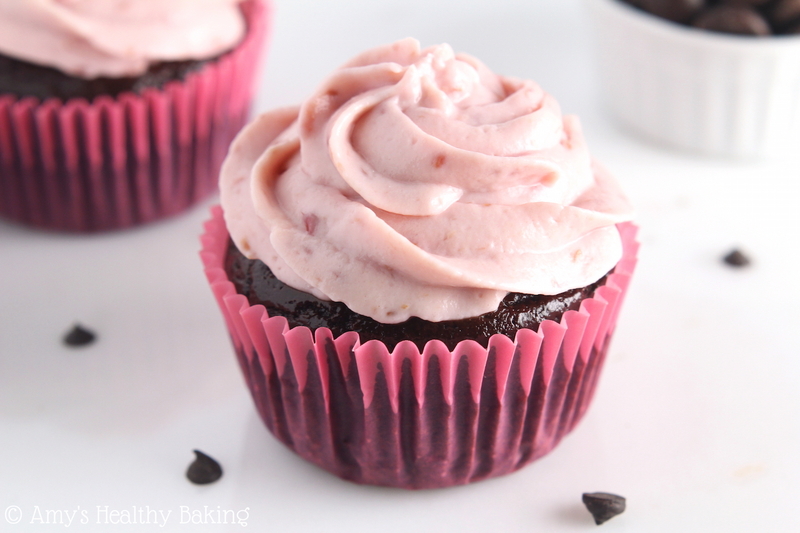 To prepare for Valentine’s Day this year, I baked cupcakes too, but I swapped out the fudgy frosting for a fruity one. My guy isn’t the biggest fan of chocolate, but since he loves berries, I hoped that would tempt him to at least try at bite. 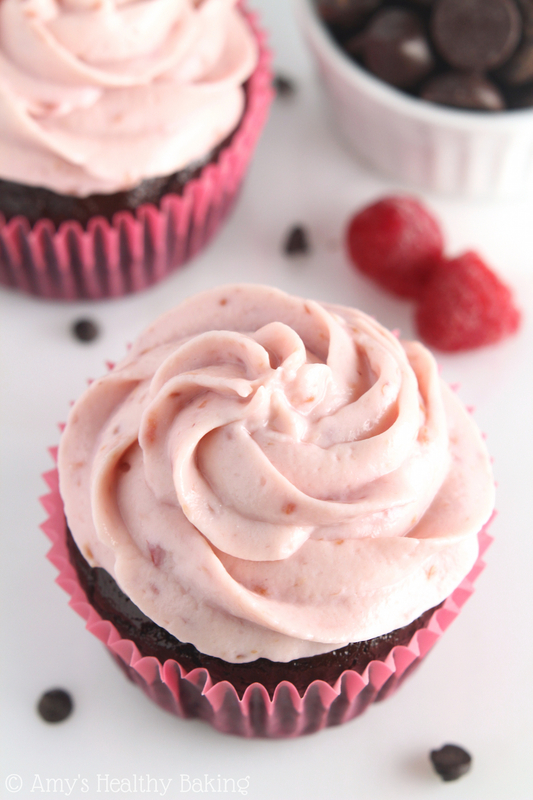 The final result was these Dark Chocolate Raspberry Cupcakes! They start with my favorite dark chocolate cupcake base. Countless readers have baked them, and many have said that they taste better than a bakery’s! These cupcakes are extremely moist and rich, meant for true chocoholics and not so much for the faint-of-chocolate-heart. The ingredients list is fairly straightforward, but I want to stress one main thing when it comes to mixing up the batter. Alternating additions are mandatory. This means that you mix in some dry ingredients, followed by some milk, and continue switching until you’ve incorporated all of both. Alternating additions prevent over-mixing the batter, which would overdevelop the gluten strands and make your cupcakes tough and rubbery. So keep them tender and moist with alternating additions! The frosting is one of my all-time favorite things. Because I dislike the taste of powdered sugar, I actually use Greek yogurt as the base for mine! Instead of sugar, the frosting is packed with protein—sneaky, aren’t we? For the fruit flavor, we’ll use frozen raspberries that have been thawed, puréed, and reduced. You want to reduce the raspberry purée because otherwise, there would be too much liquid in the frosting, which would make it runny. Combine the yogurt and purée with some instant pudding mix, and the frosting will be stiff enough to pipe for those elegant swirls! And if you have any left over? I highly recommend eating it straight from a bowl with a spoon. It’s mostly Greek yogurt with fruit, so it’s automatically healthy! So… Is it time for dessert yet? 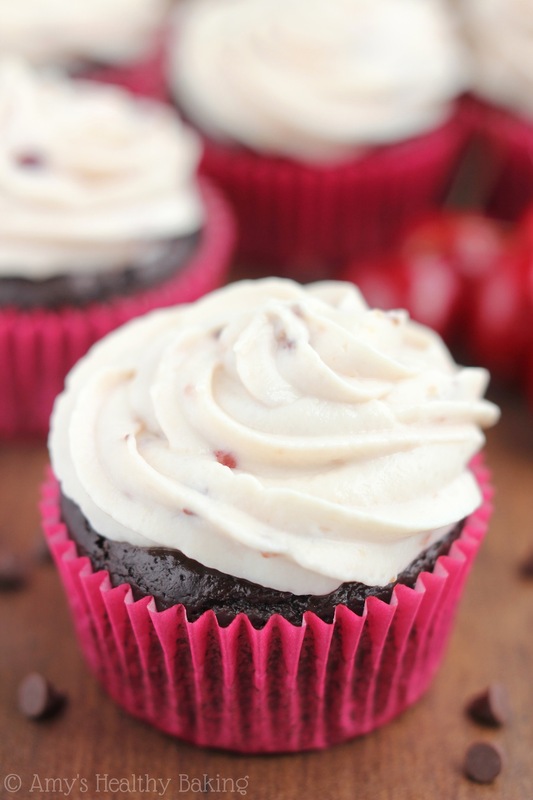 These dark chocolate cupcakes are tender, rich, and decadent—a chocoholic’s dream! 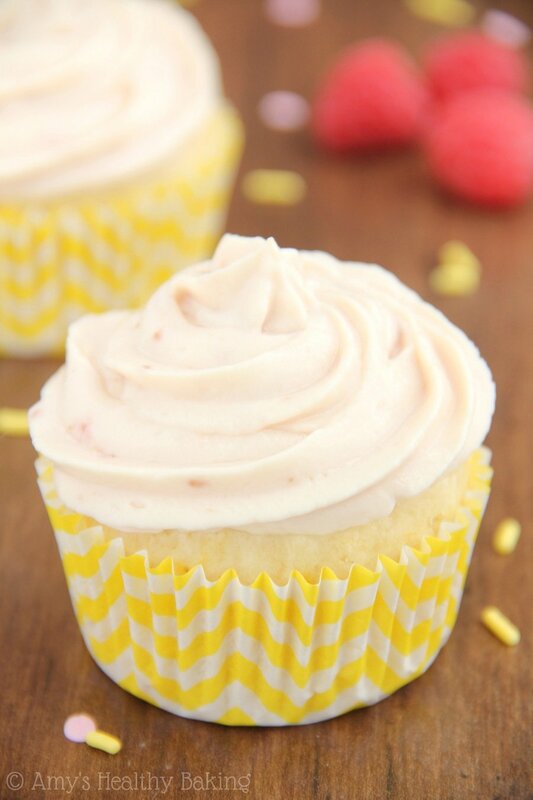 The frosting has a light raspberry flavor with a sweet vanilla background taste. They’re best if eaten the same day they’re assembled, but any frosted leftover cupcakes may be stored in an airtight container in the refrigerator for up to three days. To prepare the cupcakes, preheat the oven to 350°F and place foil cupcake liners in 12 muffin cups. Lightly coat the liners with nonstick cooking spray. Divide the batter between the prepared liners. Bake at 350° for 21 minutes. Cool in the pan for 5 minutes before turning out onto a wire rack to cool completely. While the cupcakes bake, prepare the frosting. Pulse the thawed raspberries until they’re puréed. Add the purée to a small pot, and cook over medium-low heat, stirring constantly, until the purée has reduced by half. Cool completely. Notes: I highly recommend foil liners! The cupcakes will stick less and stay moister than if you use paper liners. If using paper lines, spray them twice with nonstick cooking spray. 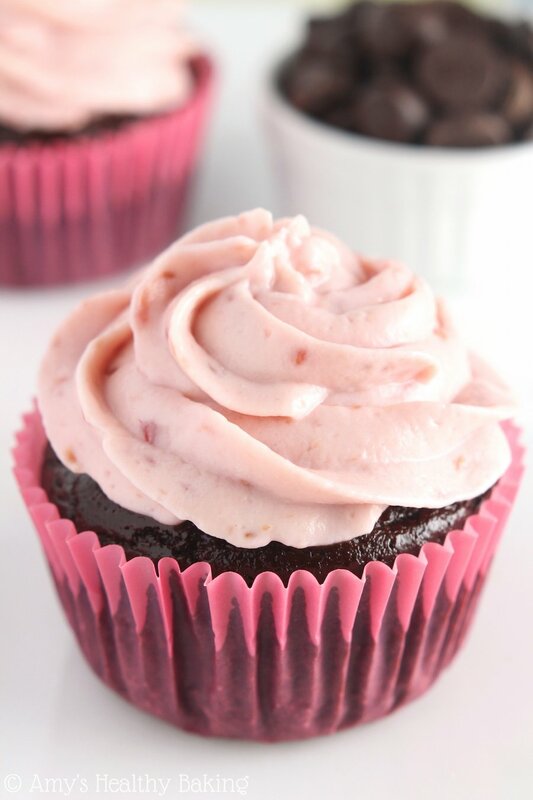 If you forget to spray the liners (foil OR paper), place the cupcakes in an airtight container for 12-24 hours to help loosen them from the liners. You will only need about ¾ of the frosting, which has been taken into account for the Nutrition Information (see link below). Try to frost the cupcakes just before serving, but if you have any leftovers with frosting, store them in an airtight container in the refrigerator (due to the yogurt in the frosting). This recipe is also easily halved if baking for a smaller crowd! Hmmm…sugar-free pudding must be riddled with chemicals and unhealthy ingredients. I would skip the frosting if you are truly meaning to stay “healthy”. Can’t wait to try these this weekend! I do wish your dry ingredients (flour, sugar, etc.) were listed by weight since that would be the most accurate, but I will try it. My mom and I were looking for a light cupcake and this will be perfect. The ingredients are already listed by weight Kira! The weights in grams are in parentheses next to the cup measurements. 🙂 I can’t wait to hear what you and your mom think of the cupcakes! No worries Kira! It’s easy to miss the grams if you aren’t looking for them. 🙂 I can’t wait to hear how the cupcakes turn out! Would the frosting hold up to piping a cake? Would it be strong enough to hold onto the sides? I am making a rosette cake for a baby shower and would like to use this icing. I haven’t tried piping it in that fashion before. It should hold onto the sides if spread in a thin layer, but I don’t have a good idea about whether the rosettes around the sides would hold their shape. If you wanted to test that before covering the whole cake, you can pipe a swirl of this frosting onto a cupcake, then turn the cupcake on its side for a while and see if it droops. 🙂 I’d love to hear what you think of the frosting if you try the recipe Gwyn, and have a lovely time at the baby shower! If I don’t want such a dark chocolate flavor (I prefer milk chocolate), what do you suggest reducing the cocoa amount to? I appreciate your interest in my recipes Ashley! 🙂 Try reducing the cocoa powder to ½ cup (remember to measure it correctly, as directed in the link, so you don’t end up with too much! ), and increase the flour to 1 ¼ cups. 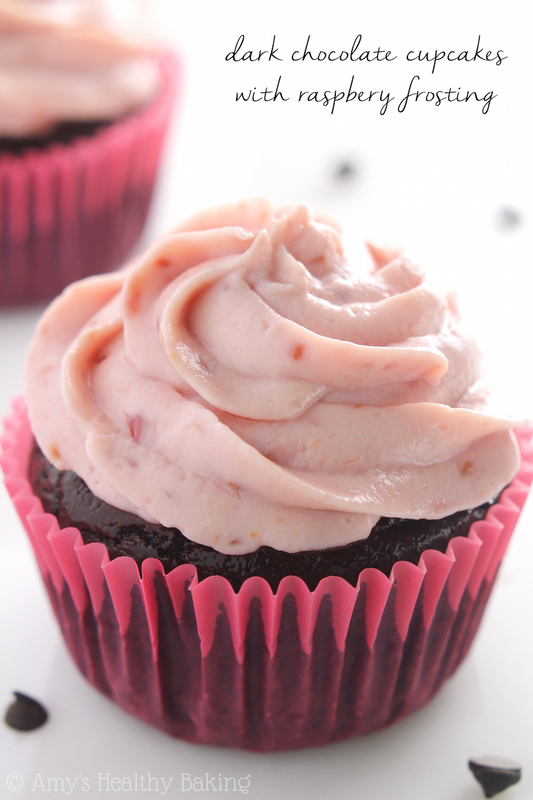 You can also increase the sugar by a few tablespoons to ensure the cupcakes taste sweeter as well. I’m excited to hear what you try and how they turn out! I was so excited to try this recipe. But the cupcakes came out very dense and dry. I measured the flour and dry ingredients the specific way you said, but now I have 12 chocolate bricks. 🙁 The raspberry frosting was delicious though. I really appreciate your interest in my recipe Lizz! 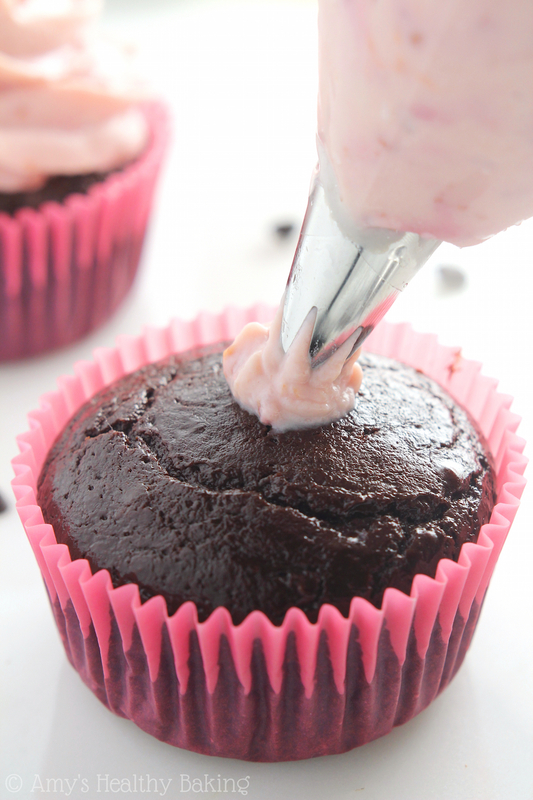 Let’s get this sorted out so your cupcakes turn out tender, exactly as they should. 🙂 To confirm, you didn’t make any substitutions, correct? And you baked them for the correct amount of time in standard-sized muffin tins? Can you be a little more specific about how you measured the flour and cocoa powder? Did you use a spoon to transfer the ingredients into the measuring cups, filling them until a mound rose above the top, and then gently scraped the back of a knife across the top to remove the excess (not pressing any flour or cocoa powder down into the measuring cups as you scraped)? I have a few ideas about what could have caused your issues, but your answers will help us narrow it down even further! Of course. 🙂 No substitutions. Normal size muffins for 21 minutes like it says. I used the spoon and scrape method. I absolutely LOVE your Peanut Butter Cheesecake, it has been my savior for dessert while I’m watching what I eat. Awww that means so much to me Lizz! I’m really glad you’re enjoying the peanut butter cheesecake so much! 🙂 If you don’t own a kitchen scale, here’s what I recommend doing for measuring flour and cocoa powder (and oats! ): use a fork to “scoop” up flour/cocoa powder from the container, and lightly shake the fork back and forth over the top of your measuring cup to transfer the flour into it. Once there’s a small mound of flour extending past the rim of the measuring cup, then place the flat back of a knife against the top of the measuring cup, and gently scrape it across the top to get rid of the excess flour. Never “pat” the flour/cocoa powder down with the knife or fork. This fork method acts like a sifter (without dirtying another dish!) 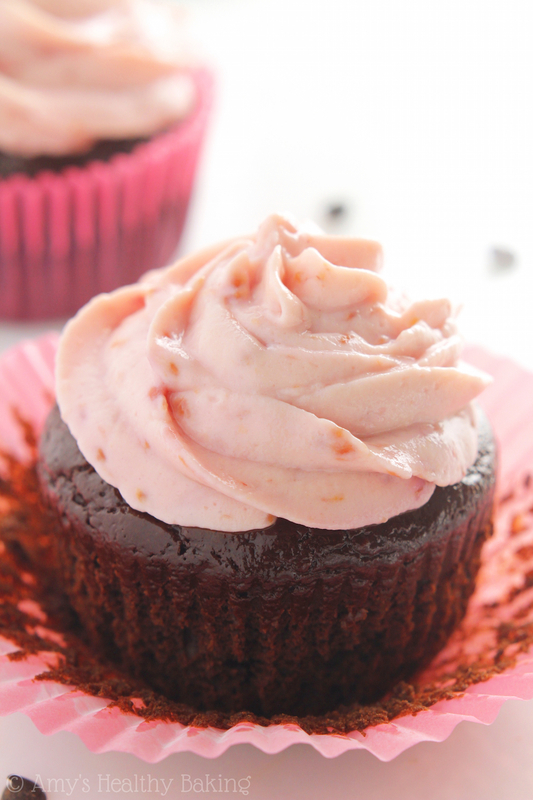 and guarantees you’ll add less flour to the batter, so you’ll end up with moist and tender cupcakes. Does that make sense? 🙂 Also, how fresh is your baking powder? That may make a difference in how the cupcakes rise as well! I did use a scale for the flour and cocoa. My baking powder is a few months old, not sure if that would make a difference. They rose, but are just very dense. It looks like this recipe and your Cookies and Cream Recipe are pretty similar, but that one calls for oil and this one didn’t. Could that be missing from this recipe? As long as you used the full 2 tablespoons of melted butter, then it won’t be an issue Lizz! 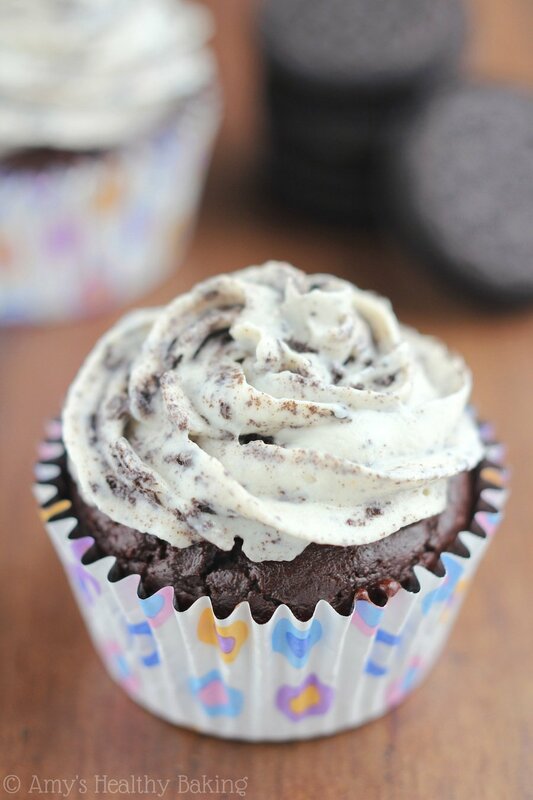 Have you made the cookies ‘n cream cupcakes before? I don’t know what’s wrong then. 🙁 I haven’t made the Cookies and Cream ones before. Are the cupcakes overly dry, or are they mostly just dense? Did you measure the sugar and Greek yogurt with your kitchen scale as well? What brand of flour and cocoa powder did you use? Miss Amy…I want to bury my face in these cupcakes! They are extremely delicious and the frosting is TDF!!! I made two batches and they disappeared in no time! Andddd…they are sooo pretty! Another recipe that is a winner!!! Thank you again! Aww thank YOU again for another sweet comment Carmelina!! 🙂 I’m so honored that you made two batches and they disappeared that quickly. What a huge compliment — thank you!! I was wondering if this recipe could be transferred to a cake recipe, and if so how much would I have to increase everything by? I just love how yours turned out and was hoping I could turn it into a birthday cake. I’m so honored that you’d like to use this recipe to celebrate such a special occasion Elizabeth! That means a lot to me! 🙂 I haven’t tried converting this to a cake, but I think it might work. I’d recommend doubling the recipe and using two 9″-round cake pans. (Line the bottoms of them with wax paper or parchment paper to make the layers easier to remove!) I’m not sure about the baking time, but I’d recommend trying 350°F for 18-20 minutes to start. The layers may need more time, but it’s much easier to pop them back in the oven than it is to bake them for less time! They’ll be done when the centers feel firm and a toothpick inserted into the center comes out clean or with a few crumbs attached. I’d love to hear how that turns out if you try it! This will really help! I’ll let you know how everything turns out!